Register Log In wirral forums Forums Pets / Animals Cats or dogs ? Which would you suggest as a better companion, a cat or a dog ? I'm Deffo a dog person Granny, not keen on cats at all. I hate the way cats stare at you and I have this horrible one who has killed the baby blackbirds in my garden I was too late to save them. It had been bothering the birds in my garden and I was out there constantly chasing it but it got them in the end actually jumped from the bush with the little one in its mouth. I know it natural for them but I was so angry. Dogs demand much more attention and show more affection generally. Cats are more independent and unless they want something, they suit themselves. So, I'd go with dogs. Doggie woggies every time, cats are nasty scratchy things that kill tweetybirds, and my lovely dog agrees with me. Another dog person here. cats are fairly independent, true but although dogs demand more input than cats, needing regular walks etc, they give so much back with their unconditional love. You are their pack leader and - if they're trained properly! - they look up to you and are very loyal. Generally speaking, they are not a threat to garden birds or prone to getting stuck up trees, either, though if bored or lonely they may chew the furniture. Personally I haven't had that problem. Both dogs I've shared my home with have been rescues, not highly bred, and have been good friends to me and mine. I'm a cat guy and if you are lucky enough to get a lap-cat then definitely a cat, dogs are too much work i find whereas yes cats are more independent but therefore they're less needy, cats are also much better to play with! plus when was the last time you heard of a beloved family cat mauling a child to death? Cats have been known to smother new born babies by getting in pram or &#263;ot and sitting on their faces. It's the sounds I think of newborns that attract them , not a common occurrence thank goodness but be aware it can happen J-Demo. I think the word "companion" has skewed the question in doggy favour. I am not a pet person but if I was forced to have either it would be a cat---even though I them for crapping in my allotment beds. Usually lot less looking after and the right ones will pop onto your lap for a bit of tlc. Bit difficult with a rottweiller. 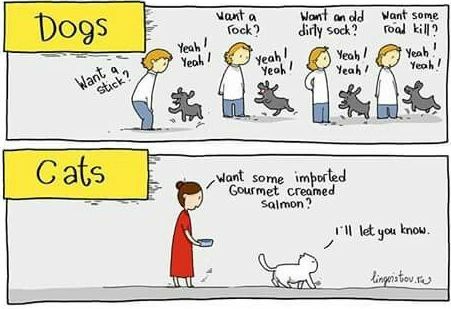 I've had cats & dogs.I agree cats can be independant but the ones I've had mainly ginger & whites have had good personalities.Dogs are more loyal plus I get out & meet people & get exercise. My cat used to follow me to the shops & my dog doesn't bark unless someone comes through the front door she doesn't know very well.